TNA doesn't normally do a lot of things right, but Tag Team Wrestling is something that has always clicked for them. Around early 2014, this fresh team called The American Wolves joined Impact Wrestling and right away become TNA World Tag Team Champions. 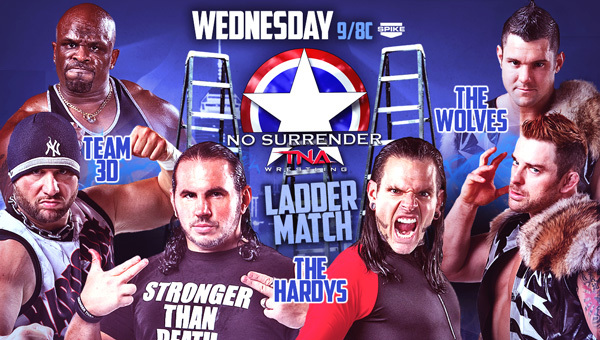 Fast forward to around August, The Hardys and Team 3D both are hungry to be Champions. 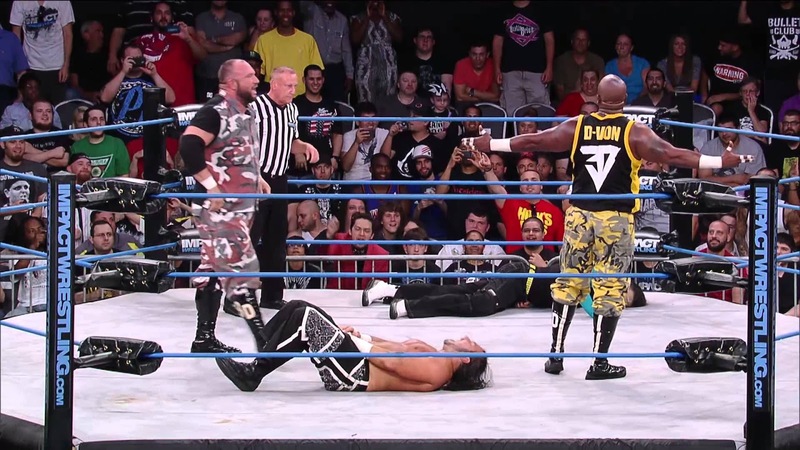 The Wolves defeated the Hardys at Destination-X in a pretty solid match. So the Hardys propose a bit of a challenge. 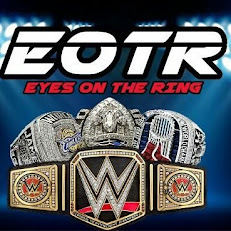 A Best of 3 Tag Team Title Series. The winner of each match gets to pick the stipulation for the following match. The first match was a regular three corners tag team match. It served as a slow build to a very fun rivalry. It was a very clunky kind of start with both challenging teams working over Davey Richards. The pace started to pick up after a Hardy Boys Poetry in Motion set up to the outside. The crowd was revived after a Moonsault to the floor by Matt Hardy. The teams each traded near falls before Team 3D caught Eddie Edwards with a 3D to take a 1 match lead. After the match, Team 3D chose a Tables match as the next stipulation. Heading into the second match, Team 3D could become the new Tag Team Champions with a win. It started in a brawl and your average table break tease. 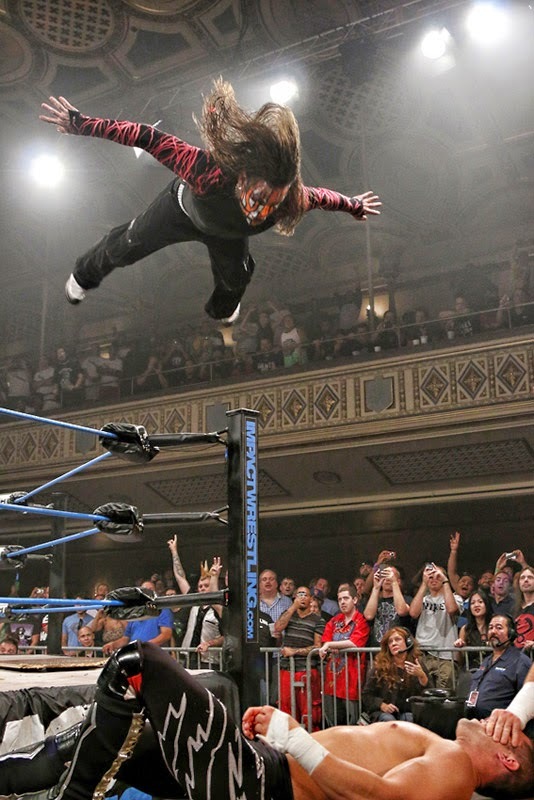 In a weird spot, Jeff Hardy fell through a table by accident but the match continued because an opponent had to put him through a table. The Wolves saved Matt Hardy from being put through a table by D-Von before the Hardys made a comeback and won with Jeff hitting a Swanton Bomb on Eddie Edwards (Consecutive L's? What a loser.). 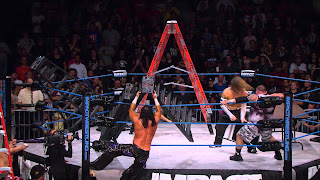 After match 2, the Hardys brought a Ladder into the ring and announced the stipulation of the next match at No Surrender which was... Well, you know where this is going. 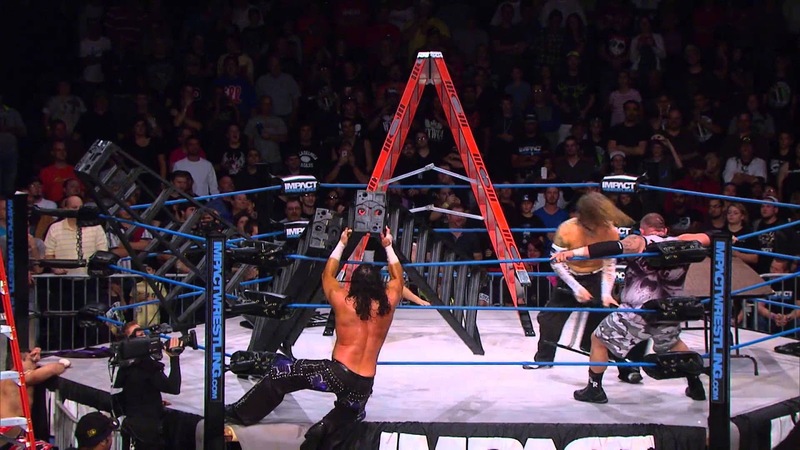 After winning match two, the Hardys and 3D both came in with a chance to become champions with a win. The match started off extremely fast paced with Wolves doing dives to the outside on both teams. Then Jeff hit a Whisper In The Wind on the champs who were holding a ladder. Tables and Chairs were later introduced and Team 3D later put Matt on table before being taken out by the Wolves. Davey then put Matt through the table with a double foot stomp. At the climax of the match, Jeff went for the belts but Davey Richards tried to take his ladder from underneath him which ended with a scary landing for him. Eddie Edwards claimed the belts tying up the series at 1-1-1. 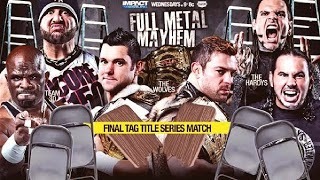 The Impact following No Surrender, The Wolves announced the final match stipulation as Full Metal Mayhem (TNA's nickname for Tables, Ladders and Chairs). The final match in the series was set with the same pace as the previous with plenty of chairshots and big spots, including Matt hitting a leg drop through a table on Davey, Jeff pushing D-Von off a turnbuckle and Davey pushing over a ladder that Jeff was on, which led to Jeff falling on top of Bully Ray who was laying on two tables outside the ring. The match ended with Eddie Edwards powerbombing Matt through a table while Davey Richards claimed the belt. This was a good series of matches that properly progressed from match to match. After each match, you pretty much knew which stipulation would be picked for the next match so it kind of took the mystery out of that but it didn't make the series any less enjoyable. Each team played up their part well, particularly the Wolves who were no doubts about it the best team overall in the series. I can't find the full matches for you guys to watch but YouTube does have the final moments of each one which pretty much summarizes most of what is written above. Nokia data recovery software free download in insert mode, pressing Ctrl-u deletes nokia data recovery software free computer turns on but no bios download text you've typed in the current line, and Ctrl-w deletes the word before the cursor.